A mobile calibration service saves time, and, with that, also money. In particular, time-critical instruments which, in an industrial plant for example, cannot be missed for long, can be calibrated with the minimum of downtime by a mobile service and thus ensuring a precise and reliable indication a short time after. The smooth operation is restored using an on-site calibration – with the minimum expenditure of time and money. Usually, with a “traditional” calibration, the instrument must first be removed from the respective application. Alongside the risk of damaging the highly sensitive measuring instrument through this removal, it usually means several days of downtime until the newly calibrated instrument can be re-installed. In today’s fast-moving age, with enormous competitive and price pressure, this means loss of time and, simultaneously, loss of money. An on-site calibration helps to keep both of these as low as possible. This is a factor certainly worth considering, especially keeping in mind the recommended calibration cycles, which, for example, are one year for temperature measuring instruments. For pressure measuring instruments: Deadweight testers should be calibrated every five years, electronic and mechanical pressure measuring instruments, every year. Through forward planning, with a mobile calibration service, you can minimise the process downtime, or even, in the best case, completely eliminate it – simply use any pre-planned process shut-down times based on required maintenance or the like, reasonable for the calibration of the instruments used. 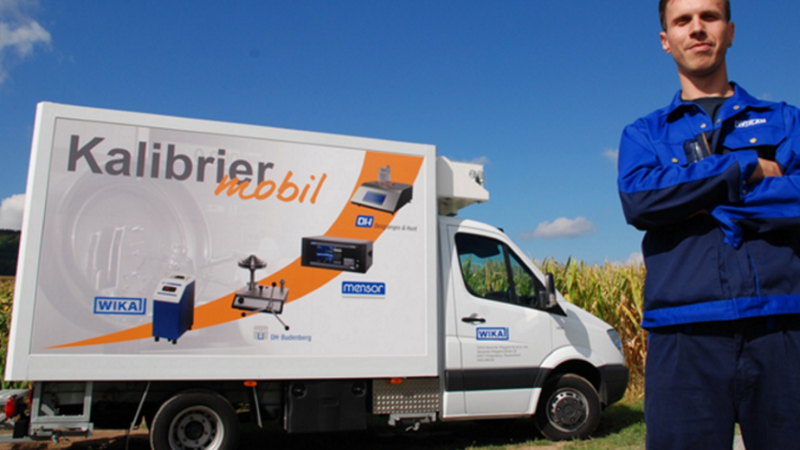 There are three calibration vans in our mobile service fleet, which are mainly travelling about in Germany, but also in neighbouring countries. These drive to over 100 different customers every year – many of these several times. Among the largest customers are aircraft and chemical companies as well as several power stations. In the calibration vans, not only are pressure and temperature measuring instruments calibrated, but they are also adjusted and repaired as required. The measuring ranges extend for pressure from -1 bar to + 8,000 bar, for temperature from -55 °C to +1,100 °C. For temperature measuring instruments, factory calibrations are carried out – for pressure measuring instruments, even DKD/DAkkS calibrations. All data from the test procedures are recorded digitally and the corresponding certificates are printed directly. Each van features up to 35 fixed and mobile reference instruments for pressure and temperature with an accuracy of down to 0.025 %. Alongside the measuring instrumentation, the calibration van features a workstation and also standard spare parts for small repairs. Oil and grease-free calibrations up to high-purity nitrogen 5.0 as a medium are possible. With the equipment available, instruments can be checked and calibrated directly in the plant. Further information on the mobile service from WIKA can be found on our website on the calibration & service centre pages. There you will also be able to learn more about the various service packages which can make your (calibration) life even easier. Naturally, we can also offer you traditional calibrations in our calibration laboratories in Klingenberg. There is also a request form for (re)calibration on our website.